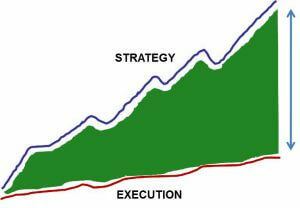 We help organizations bridge the gap between Strategy and Execution. There is a gap that exists between what most organizations are targeting to achieve and their actual performance. This “Execution Gap” is much larger than most Executives realize. The good news is that the Gap can be closed! The Hampton Group is an Operations and Management Consulting Firm established to assist middle-market companies close the Execution Gap and achieve superior levels of performance. We believe in serving our clients by adding value to their organization thru our hands-on problem solving approach. We provide the short-term horsepower to enable organizations to break through their challenges by filling knowledge gaps, conducting problem analysis and teaching or implementing new processes. Our clients are typically small to medium-sized businesses focused on taking their organization’s performance to the next level. Often our clients are family owned or privately owned businesses that recognize they must transition from being a small entrepreneurial to a more professionally managed organization…without losing their “magic”. Therefore, our solutions are based on a practical application of Best Business Practices that address our clients’ unique requirements. When People, Processes, and Strategy are aligned…the path to Execution becomes clear. Founded in 2003, The Hampton Group is an Operations and Management Consulting Firm established to assist middle market companies achieve superior performance levels. We look forward to working with you to generate innovative solutions to drive bottom line performance.